Frank Drake is one of the principal founders of the search for extraterrestrial intelligence (SETI). 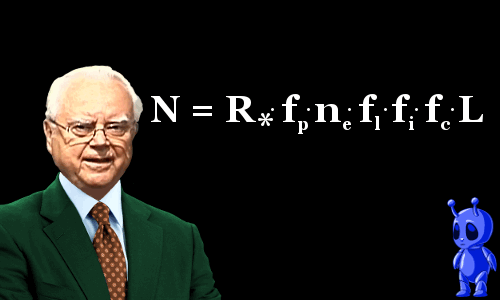 He is best known for devising the Drake equation, which can be used to estimate the number of intelligent civilizations in our galaxy; he is one a handful of scientists who have devised equations that have penetrated popular culture sufficiently to appear on t-shirts and other merchandise. Drake has played a key role in composing messages sent out from Earth in the hope that one day an alien civilization will discover and read them. In addition to his SETI work, Drake was the first person to map the center of the Milky Way galaxy, and he coined the word ‘pulsar’ to describe rapidly rotating neutron stars. Frank Donald Drake was born in Chicago, Illinois, USA on May 28, 1930. His father was Richard Drake, a chemical engineer working for the city of Chicago. His mother was Winifred Thompson, who met Frank’s father when they were students at the University of Illinois. Frank was the couple’s eldest child; his younger sister Alma became a biochemist, and his younger brother Robert became an economist. As a child, Frank’s experiences of religion were rather negative. His parents were Baptists who lived rather austerely – laughter and joy were conspicuous by their absence. At Sunday school, Frank decided that different religions had narrow beliefs shaped mainly by whichever part of the world they had begun in, and some of these beliefs had come about by chance. This led him, at age eight, to conjecture that human civilization was the result of chance too. Elsewhere in the universe, he thought, other civilizations might be present. Becoming ever more interested in science, Frank began making frequent visits on his bike to Chicago’s Museum of Science & Industry. He came to know the museum’s exhibits by heart, including one revealing that our sun is an average star among billions of others in the Milky Way. This made him wonder again if alien civilizations could be here in our galaxy. Together with a friend he began doing simple chemistry experiments and building small motors and radios. Later they graduated to messing about with car engines. At age 17, Frank won a Navy scholarship that enabled him to go to Cornell University, in Ithaca, New York. He intended becoming an airplane designer, but became more interested in electronics. He eventually majored in engineering physics. In his sophomore year he took a course in astronomy. 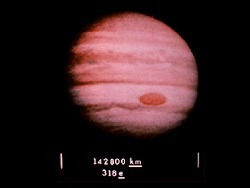 He looked at Jupiter through a 15-inch telescope and was stunned by what he saw – the beautiful planet, with its famous red spot, orbited by the four moons Galileo first saw about 337 years earlier. It was a life-changing moment for Frank Drake. Struve correctly deduced that stars are usually not alone: like our own solar system, a central stars is accompanied by orbiting planets. He concluded that life might very well be present elsewhere in the galaxy. So, thought Drake, here is a serious, respected scientist, talking about life on other planets; it was the first encouragement Drake received at college to consider the possibility of extraterrestrial life. After graduating with honors in engineering physics, Drake decided to become an astronomer. First, though, he had a debt to pay to the U.S. Navy, which had funded his education. After an electronics training course he took to the high seas, responsible for the electronics on board the Albany, the Sixth Fleet’s flagship. Drake was responsible for the electronics on board the heavy cruiser U.S.S. Albany. Radio telescope at Goldstone, California. In the fall of 1955, Drake began as a graduate student at Harvard University. 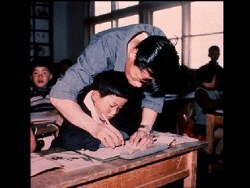 The astronomy department’s chairman Barton Bok was eager to make use of Drake’s electronics expertise, so Drake was assigned to work in radio astronomy. Radio astronomers analyze signals reaching Earth in the radio part of the electromagnetic spectrum. 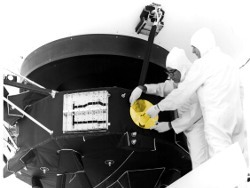 They can also use radar-style techniques to study planets – sending out a radio signal to rebound from a planet, returning with information about the surface it bounced from. With his Navy experience, Drake soon became an essential member of a Harvard team whose equipment, driven by unreliable vacuum-tubes and amplifiers, was always breaking down. The Milky Way viewed in different parts of the electromagnetic spectrum. During his first year as a graduate student, Drake realized that radio astronomy was probably the way we would first detect or make contact with an alien civilization. 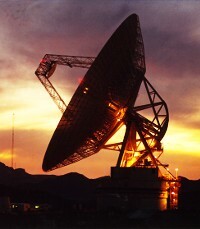 Drake’s first job after graduating from Harvard took him to the National Radio Astronomy Observatory at Green Bank, West Virginia in April 1958. As a newly appointed staff astronomer he was impressed by Green Bank’s 85-foot radio telescope – it was his first opportunity to work with equipment sensitive enough to detect radio transmissions from extraterrestrials. Green Bank’s receiver could detect an equivalent radio telescope at a distance of 12 light years – good enough to listen to transmissions from about 30 star systems, including several stars similar to our sun. In 1959, Drake secured agreement with other workers at Green Bank to begin a project he called ‘Project Ozma,’ hunting for aliens’ radio transmissions. They agreed to keep the project secret for fear of ridicule. In September 1959, before Project Ozma had begun, Giuseppe Cocconi and Philip Morrison published a paper in Nature entitled Searching for Interstellar Communications. 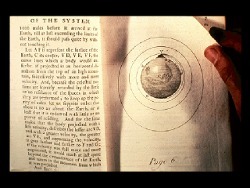 The authors proposed that astronomers should carry out a search similar to Drake’s project Ozma. This compelled Drake to go public with his planned work. Project Ozma’s observations began on April 8, 1960. No aliens were detected, but a graduate student at Cornell by the name of Carl Sagan contacted Drake, which led to lifelong cooperation between the two astronomers. Drake’s first achievement with the radio telescope at Green Bank was to map the center of the Milky Way galaxy for the first time. Until then, nobody had seen it because large amounts of dust at the galactic center block visible light. The dust does not block radio waves, so Drake was able to use radio frequencies arriving from the Milky Way’s center to map it. In visible light the Milky Way’s center looks dark. 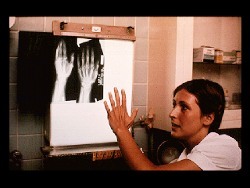 Radio waves, however, show there is intense activity. Drake and Hein Hvatum discovered Jupiter has radiation belts similar to Earth’s Van Allen belts. Drake discovered that the high temperatures on Venus do not change between day and night, and he deduced that Venus’s atmosphere is about as thick as the ocean on Earth, trapping heat. He found that winds on Venus move at just a few miles an hour. He devised a new method of analyzing the polarization of radio waves to assess the geography and topography of a planet’s surface, which eventually allowed Venus’s surface to be mapped accurately. In summer 1961, Drake got a phone call that changed his life. 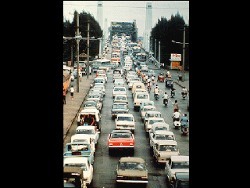 The caller was Peter Pearman, a biologist on the Space Science Board of the National Academy of Sciences. Pearman was enthusiastic about Project Ozma and wanted to work with Drake to organize a conference at Green Bank to push the search for life on other planets. Drake and his colleagues put together a list of distinguished scientists and invited them. Drake bought a case of champagne, because he correctly anticipated that one of the attendees, Melvin Calvin, would be announced as the winner of the Nobel Prize in Chemistry while at the conference. Drake wrote a list of conference topics and noticed something fascinating: every important topic could be expressed as a number. The Drake equation has become an icon of science – particularly astronomy, and even more particularly SETI. Drake has joined an elite group of scientists including Albert Einstein and James Clerk Maxwell whose equations have caught the public imagination (or at least the science nerd segment) enough to appear on t-shirts and other merchandise. The equation has also spurred fierce debates, because most ‘reasonable’ values inserted into the equation suggest our galaxy should be teeming with life and we should already have detected a civilization. Drake himself was over-optimistic about how soon we would detect an extraterrestrial civilization. More than five decades after Drake devised it, the Drake equation continues to spur fresh thinking about extraterrestrial civilizations. Frank & Sullivan found that if the chance of a technological species evolving on any single habitable planet is better than 1 in 60 billion, then it’s likely that a technological civilization has existed on another world somewhere out there in the Milky Way. Looking at the whole observable universe, even if the probability of a technological civilization in a solar system is just one-in-a-trillion, then during the universe’s existence, ten billion planets will have been home to technology-producing life. 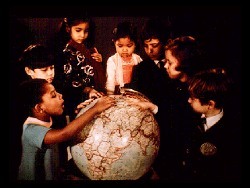 We might never hear from these civilizations though. The probability of our own civilization being destroyed by nuclear war or some other factor in the next few thousand years is significantly higher than zero. Since we cannot rule out the possibility that technological civilizations find some way to destroy themselves within a few thousand years, then even if our own Milky Way galaxy has been home to a thousand extraterrestrial civilizations they are all likely to be extinct by now. Putting ‘reasonable’ numbers into the Drake equation suggests extraterrestrial civilizations have existed in the past, exist in the present, and will exist in the future. If, however, technological civilizations last for only a few thousand years, we probably are alone in the Milky Way. On the other hand, long-lived civilizations might reach a stage where they stop leaking radio signals into space. In these circumstances, there may be no shortage of advanced civilizations in the Milky Way right now, but they cannot be detected by radio astronomy. 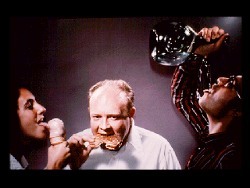 In 1963, Drake, who was 33 years old and already white-headed, was persuaded to leave Green Bank and become section chief of Lunar and Planetary Science at the Jet Propulsion Laboratory (JPL) in Pasadena, California. He did not stay long. Early in 1964 he resigned from JPL, because an ever-growing mountain of administrative work was preventing him doing the research he had expected to carry out. In June 1964, he returned as an astronomy professor to Cornell. 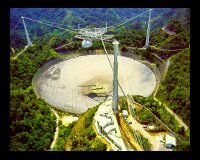 Between 1966 and 1968, Drake worked in Puerto Rico as director of Cornell’s enormous radio telescope at Aricebo. During this time, he coined the word pulsar for a new type of star discovered by Jocelyn Bell Burnell and Antony Hewish at the University of Cambridge in the UK. 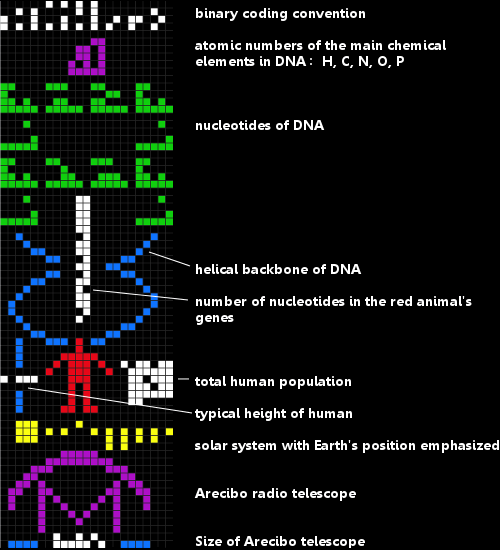 Arecibo message on left created by Arne Nordmann. The actual transmitted image was not colored, it was black and white. If anyone is around in M13 to receive the message, we shouldn’t expect a quick response – M13 is about 25,000 light-years away from Earth. The Arecibo Message was not the first experience Drake had of composing messages to alien civilizations. He and Carl Sagan designed the Pioneer Plaques, which went into space attached to Pioneer 10 in 1972 and Pioneer 11 in 1973 – these were the first ever spacecraft built to escape from the solar system. 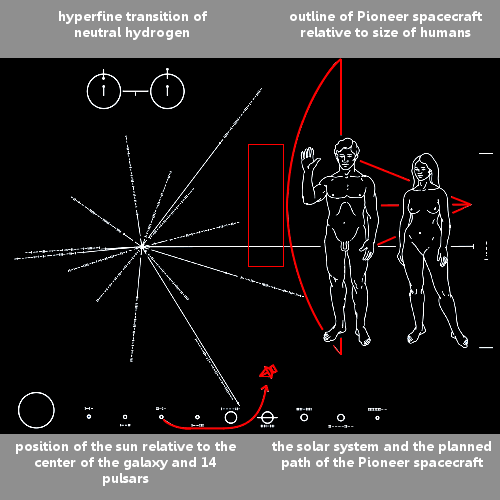 Scientists monitoring Pioneer 10 lost contact with it in 2003 at a distance of 80 astronomical units when its radio transmitter lost power. 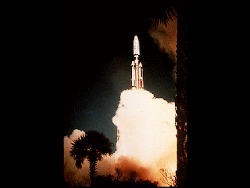 Contact with Pioneer 11 was lost in 1995. In January 1977, Drake and Sagan teamed up again to plan the message the Voyager spacecraft would carry. They considered repeating the Pioneer Plaque, but this time Sagan wanted to send music on a phonograph record. Drake was certain it would be a mistake not to send images, so they agreed to send both. 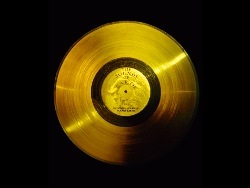 The phonograph – known as the Golden Record – eventually contained over 100 photos and about 90 minutes of audio, including music, people talking, whale songs, a heart beating, and a variety of other sounds. 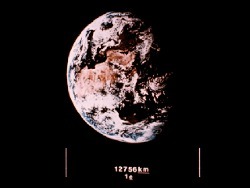 More photos are available from NASA. Voyager 1 is now 137 astronomical units from Earth. Voyager 2 is 113 astronomical units from Earth headed for an encounter in 296,000 years’ time with Sirius, the brightest star seen from Earth. 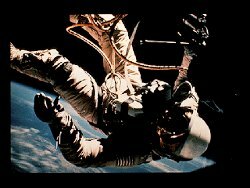 On April 8, 1960, the very first day of Project Ozma, Drake’s team believed they had discovered an extraterrestrial transmission. They pointed their 85-foot radio telescope at the star Epsilon Eridani, about 10.5 light-years from Earth. Immediately they picked up a radio signal beating at a perfectly regular 8 times a second – there was huge excitement in the telescope’s control room. When they pointed the telescope away from the star the signal disappeared. When they pointed it back at the star the team were disappointed when they couldn’t pick up the signal again. This left them unsure if they had made a great discovery or a great mistake. Gossip about a hullabaloo at the observatory reached the ears of a local newspaper, and a reporter phoned Drake, who was not in a position to give definite answers to any of the questions. He could neither confirm nor deny that they had detected a signal from aliens. He said more work was needed. After further investigations, Drake came to the conclusion that the signal was actually an airborne jamming system being tested by a nearby military airbase. A conspiracy theory then developed around the incident with ‘believers’ claiming first contact had been covered up. One thing is certain. If the search for extraterrestrial life ever does detect another civilization in the depths of space, it will totally change – it is hard to imagine just how dramatically – our feelings about the place of human beings and our planet in the cosmos. Drake’s first wife was the composer Elizabeth Bell, with whom he had three sons: Paul became a photographer, and Stephen and Richard both became musicians. Drake met his second wife Amahl at Cornell. They have two daughters: Nadia, who became a science journalist; and Leila, who became a ballet dancer. After 20 years at Cornell, Drake moved to California in 1984 to become Professor of Astronomy and Dean of Natural Sciences at the University of California at Santa Cruz: he is now Emeritus Professor of Astronomy and Astrophysics. Drake continues to serve on the Board of Trustees of the SETI Institute. In his spare time his hobbies are horticulture and lapidary. "Frank Drake." Famous Scientists. famousscientists.org. 26 Nov. 2016. Web.